The OL-AMP is equipped with 2 amplifier output channels (max. 20W output power/each), 2 control input and 2 contact output for logic control, RS485 for external remote control, and 24VDC power input. 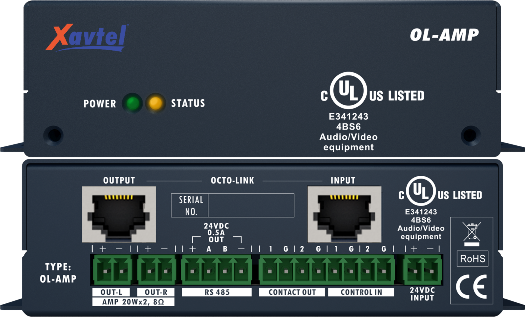 To provide a new level of flexibility for OCTO Jr applications, the exclusive OCTO-Link is designed to connect to the OL-AMP and the RWD devices. Each OCTO-Link port provides 2 audio channel inputs and 2 audio channel outputs which simultaneously transmits bidirectional data communication in digital format. The OL-AMP is capable to cascade up to 16 OL-AMP units and one RWD wall-mounted remote (at the end of the bus). The connection of OCTO-Link can be easily connected through STP CAT5/6 up to 820 ft/250m. And if the power of OL-AMP units is not enough, the OL-AMP can connect to a 24VDC local power supply. The OL-AMP also has all necessary protection circuits to detect the issue of overload or overheat and protect the device against all potential hazards.